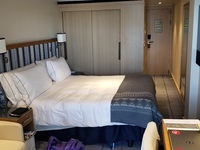 We have been on a Viking River cruise and really liked it. 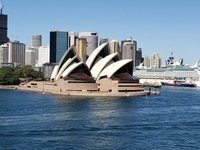 Have always had Australia/New Zealand on our list, so decided to try their ocean cruise. It was a great trip. It did not have the high budget shows, or casino or big parties, but had the level of entertainment and activities suited to what we like. They had a wonderful pianist, creative guitarist, violin/cello duo and fun singing group, all who entertained every day somewhere on the ship. We took all the included tours, which are mostly city tours, which are all considered easy, and fit our walking ability. Mostly ate on the 7th floor buffet so we could look out at the cities. Got really lucky and started in Auckland on their anniversary day which was celebrated on the pier next to the ship. Lots of music and fireworks. Learned a lot about New Zealand on the trip, which was our main objective. 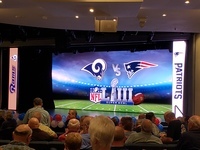 Watched the Super Bowl in the middle of the Tasman Sea, which was technologically cool. The one suggestion we would make to Viking would be to have scheduled seating times in the Restaurant, and assigned seating with other couples. We have done that on a number of cruises and found it a great way to get to know other people. The best part of our trip was the post cruise extension, Best of Australia, where we want out to Uluru-kata tjuta National park and Alice Springs. Had a great tour guide and lots of interesting sites to see. Learned so much about Aboriginal culture and history, as well as geology. Overall a very relaxed, enjoyable trip. 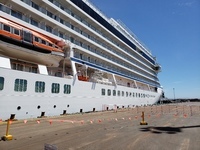 We liked the smaller ship and hope to take more Viking River and Ocean cruises in the future. 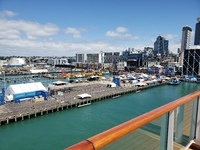 Auckland Anniversary Day celebration on next pier. Coming into Sydney Harbor on a beautiful day. Nicest, largest bathroom we have had on a cruise ship. Learned about recent earthquake and how they are recovering. Lots of traffic, but also lots of history. Interesting seeing where the Olympics where held. Lots of really nice beaches.